The biggest travel blogging conference is coming to Zimbabwe in 2018, but are they making a deal with the devil? The “largest conference and networking event for travel bloggers”, called TBEX, is heading to Africa for the first time. Which African nation is lucky enough to win the patronage of hundreds of travel bloggers and a shedload of hashtag attention? Namibia? Botswana? Kenya? Tanzania? South Africa? I’ve been a Zimbabwe travel blogger for seven years, and the country has not been at the top of most people’s African must-see list. I get the feeling that tour operators get nervous when they talk about itineraries in Zimbabwe, worrying how their customers might react. Some travel websites hail the wonder of Victoria Falls, but locate it in the generality of “southern Africa”, hiding the fact that the majority of picture-perfect viewing points are in Zimbabwe. I’m used to blogging for a select number of people. I’m the only independent blogger who writes solely about Zimbabwe travel (that I know of), and there is a reason for that. In 2015, the number of visitors to Zimbabwe was four and a half times less than South Africa, and five times less than Morocco (according to UNWTO). This sounds great for Zimbabwe at first glance: TBEX is likely to attract writers from all over the world who may not otherwise have visited. Nadeen from The Sophisticated Life writes: “I feel that travelers are more likely to visit Zimbabwe because of TBEX vs ever going there on their own.” Secondly, the online reach resulting from the conference is likely to be impressive, with bloggers publicizing their experiences far and wide. Now, I’m grinning. What an opportunity for Zimbabwe, and what an opportunity for the hundreds of people who’ll visit it for the first time. I’ve made no secret of the fact that I support responsible, independent travel to Zimbabwe, because I’ve seen that Zimbabwean livelihoods and communities can be assisted through the tourism industry, and I’ve observed how tourism money can great help conservation efforts when it’s done right. There are also a number of preconceptions about Zimbabwe that I’m keen for the bloggers to help dispel, like the ones about Zimbabwe being dangerous for tourists, or lacking in wildlife, as outlined in this Matador article. Hey, I’m just happy that a few more people might learn that Great Zimbabwe is an actual place. Along with the excitement, there are alarm bells chiming here. Who’s going to sponsor the conference and the various tours around Zimbabwe? I know that local hotels and tour companies are fighting to earn every cent, battling a host of economic and logistical challenges. These are not companies that readily offer free board to unknown writers who are unaffiliated with established media, whose readers do not regularly visit Africa. In addition, Zimbabwe is not a country geared to hosting such large groups of people. The arrivals area of Harare International Airport has fewer than five ladies’ toilet cubicles, not all of which are guaranteed to have running water. I watch the teaser video for TBEX Africa, and a familiar font appears on the screen; I’ve seen this video before. The beguiling montage ends with a reference to the website Zimbabwe Tourism, which falls under the Ministry of Tourism. It seems that the primary (and currently, the only) sponsor of TBEX Africa will be the Zimbabwean government. I watch the interview with Pauline Ndlovu from the Zimbabwean Tourism Authority, and her language is heavily focused on what they (the ZTA) will be doing, rather than on Zimbabwe itself. You know that part where I said how tourism can help Zimbabwean communities and conservation? That’s only if it’s in the right hands. As beautiful as the TBEX teaser video is, and as fantastic as I think Zimbabwe travel is, the game changes when direct alliances are made with the government. We all know the saying about being careful who you get into bed with. What sort of partner would the Zimbabwe government be? The state controls much of the media, so we only get half of what’s really happening on the ground, but grim stories still come to light: the anti-government activist who was pushed into an unmarked vehicle and never heard of again, the mass eviction of thousands of city-dwellers, the sale of dozens of wild baby elephants to abusive zoos in China, the pastor imprisoned for speaking out against the government, the photos of ordinary people left unable to walk after police beatings, the ruling party withholding food from the poor in return for votes, the daily police harassment of civilians. In contrast, the children of government ministers wear gold-plated sneakers, a whopping $15 billion has gone “missing”, and the Vice President builds a 50-bedroom house. If we’re concerned about ordinary Zimbabwean people, then we shouldn’t downplay the abuses that they are experiencing. There’s also a saying about doing a deal with the devil, and we simply don’t yet know what sort of deal has been made. A policeman kicks an elderly woman to the ground in Harare, Zimbabwe. Source: The Independent. Why is the government partnership a potential gamechanger for TBEX’s reputation? It’s one thing for tourists to visit Zimbabwe in solidarity with ordinary Zimbabweans. It is quite another to visit whilst holding hands with the Zimbabwean government, which has one of the worst reputations in the world for abusing its own people. Some bloggers may overlook this aspect of the conference, telling themselves that the government will be at arm’s length. However, the headline TBEX Africa event is taking place at Rainbow Towers Hotel, which is owned by the government. This is the same five-star hotel in which Zimbabwean Vice President Mphoko made his home between 2014 and 2016, at the expense of the Zimbabwean taxpayer, whilst civil servants were told that their salaries could not be paid. When people demonstrated about the VP’s stay, he was reported as saying, “Every time these people complain, I add another month to my stay at that hotel”. Even the location of the conference has shadowy connotations. If the Zimbabwean government is funding the conference, will they use it as a propaganda tool to push a positive view of the country, faking legitimacy to their own people? Possibly. I do find it interesting that TBEX is taking place from July 25-27, which will likely be in the run-up to the Zimbabwe general (presidential) elections. Will the conference be used as another method of election puppetry? Even if this is pure coincidence and there is no ulterior motive, it will be interesting to see if the bloggers witness political tension during their stay. I also have to wonder at the decision of TBEX to choose Zimbabwe the kickoff location for its very first African conference. I can think of at least five other African countries which have better track records than Zimbabwe (both in terms of democracy and large-scale travel facilities) and would have arguably been a much more sensible choice. This makes me question the integrity of the relationship between TBEX and the Zimbabwe government, especially given the TBEX controversies raised in Adventurous Kate’s post. What did Zimbabwe have that the others didn’t? To boycott the conference or not? Where do I go from here? Do I denounce TBEX Africa 2018 as unethical? From what I can tell, TBEX has regularly partnered with a host country tourism board as well as private tourism companies. I’d imagine that it would be almost impossible to hold a conference of this kind in Zimbabwe without co-operation with the government, so realistically the connection is inevitable on a basic level. (Although TBEX could have chosen to co-operate with African countries with better track records, as I’ve mentioned). We don’t yet know the full lineup of Zimbabwe sponsors at TBEX. My worry is that the majority of tours will be state-owned or tightly controlled (and believe me, the quality will suffer as a result). The alternative is that a host of forward-thinking sponsors will be intelligently facilitated by TBEX: organisations with proven track records of community development, conservation investment and employee reward schemes. Responsible travel companies do exist in Zimbabwe, and they have been fighting to ensure that the nation’s tourism industry hasn’t crumbled to the ground. They should also receive the international coverage that TBEX offers. Staff at Wilderness Safaris, an organisation that has an Ethics Charter and Code of Conduct. Source: Wilderness Safaris. Shane Dallas, conference director for TBEX Africa, said in a comment on Adventurous Kate: “Africa does not need to be rescued, Africa needs to be understood”. My hope is that the conference organisers will take steps to prove their understanding of the political situation as well as the social landscape. The organisers can do this by carefully examining all sponsors’ track records from this point onwards, and by not allowing the Zimbabwe Tourism Authority to manipulate the conference for their own ends. Travel can indeed be a way of showing solidarity with Zimbabwean people, but not if you’re on the side of the government ministers who bully them. TBEX Africa can either be the puppet of a self-seeking regime, or an advocate for progressive Zimbabwean organisations. The jury is still out on which it will be. Until more details of TBEX Africa are announced, it’s simply too early to either support or boycott the conference. Let’s keep the conference accountable to its mission statement as we discuss these important issues. But please, hold both the celebrations and castigations until we know more details. What else should TBEX Africa attendees be aware of? Visas for media representatives: Apart from TBEX dates being close to the Zimbabwe elections, it’ll also be interesting to see what visa requirements are in place for conference delegates. The delegates of TBEX Africa will not be visiting Zimbabwe merely as average tourists, because this is a conference for bloggers who are expected to write about their visit; they are arguably online journalists. Delegates will inevitably share their stories of Zimbabwe on platforms read by thousands of people, and this could be a risk for the Zimbabwean government. Zimbabwe is strict about allowing foreign journalists into the country (even when it comes to travel and music), and extra paperwork is usually required to allow media representatives into the country. The Zimbabwe Tourism Authority website states that “all journalists visiting Zimbabwe need to be accredited by the Department of Information and Publicity”. You can also read about the visa struggles of a visitor to Zimbabwe in connection with a film festival. Propaganda: The Zimbabwe Tourism Authority is likely to take measures to project a rose-tinted view of Zimbabwe to delegates, so that the whole endeavor doesn’t backfire on them. The Tourism Authority may orchestrate delegates’ movements so as to shield them from potentially negative aspects. Distraction techniques are not limited to governments – they are used by tour companies and tourism boards the world over, but in this case, the negative side is arguably more serious than in many other situations. Be aware of the unseen restrictions that may be present. 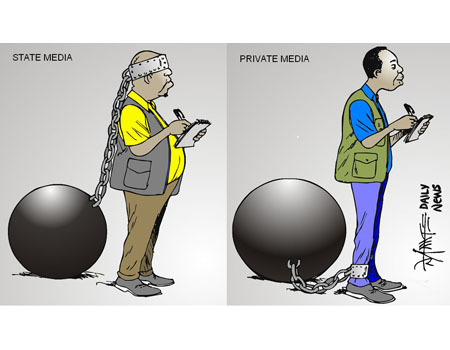 Cartoon about press freedoms, by Zimbabwean artist Tony Namate. Source: Sampsonia Way. The problem is that the propaganda can be quite convincing, even to non-Zimbabweans. There are some local articles about amazing achievements of the Zimbabwe government that seem genuine, but not all of them are trustworthy. If you read a glowing report about a success, my advice would be to assess it and question what ulterior motives there may be. If the report is written by a biased source (especially a state-owned one), then you should definitely downplay it. Restrictions on other freedoms: In Zimbabwe it is illegal to display homosexuality in public, which means that gay people are at risk of imprisonment. It is also illegal to take photographs of government offices, airports, military establishments, official residences, embassies and other sensitive places, police or military servicemen in uniform, and of public demonstrations. It is also against the law to wear any form of clothing containing camouflaged patterns. See staying safe in Zimbabwe. Zimbabweans, make your voice heard on this issue! The only way that the outside world can truly understand the Zimbabwean situation is to hear the opinions of those who know it best. There’s a (surprisingly) large debate going on online about this, mainly from people who don’t really know what it’s like on the ground. Please, write comments on others’ blog posts and publish your thoughts on other platforms. See Adventurous Kate’s post | Simon Vaughan’s post | The Sophisticated Life’s post | Passports & Grub’s post | Follow both #TBEX and #TBEXAfrica on Twitter. If you think that foreigners don’t have a right to judge other nations because all governments are corrupt in some way: please decide the point at which a government has gone too far. No government is perfect, but we all have to draw a line. All governments have committed iniquities in the past, but some of them committing those crimes willfully, right now. Grab a cup of coffee have a read of these articles below, many of them written by black Zimbabweans, so that you can say with good conscience that you’ve researched the Zimbabwe question. Check out the names of the people who wrote the articles, and the ownership of the websites, so that you can see that it’s not just white people who are concerned about basic human rights in Zimbabwe. The story of Itai Dzamara, written by his wife | The nationwide eviction of thousands of city dwellers | The sale of wild baby elephants to China | The story of Evan Mawarire | Photos of people beaten up by police in Zimbabwe | How the ruling party withholds food from the poor in return for votes | An analysis of police harassment of people in Zimbabwe | Linda Masarira’s jail story | How government ministers spend money on gold-plated sneakers | The “missing” $15 billion of taxpayer’s money | The VP’s 50-bedroom house. Also, why not follow some more Zimbabwean writers and the background of #ThisFlag, and#ThisFlag hashtag on Twitter for some homegrown opinions. But it’s just white people who complain about Zimbabwe’s government, right? Following on from the above, I’ve noticed that there’s an opinion that only white people are critical of the Zimbabwean government, and that most black people in Zimbabwe are fine with their way of life. The majority of Zimbabwe critics in Western media are indeed white, but remember this: one of the features of white privilege is having greater freedom to criticize institutions and less fear of punishment by those in power. Those white journalists and bloggers are (sadly) at greater liberty to express themselves. In Zimbabwe, it was against the law merely to insult the president until recently, and police were able to enforce this liberally. Zimbabweans have demonstrated, rallied and marched against the government – often resulting in police beatings and imprisonment. Some people who express their dissidence simply go missing and never return. This kind of intimidation has a profound effect on citizens and it’s arguably one of the reasons Mugabe has stayed in power for so long and why you don’t read as much about this online as you’d hope. In addition, one of the failings of online news and social media algorithms is that many important African issues don’t have enough ‘likes’ to get anywhere near the top of your news feed. I’ve provided links to reports written by black writers who have have spoken out (see above), but it is difficult to describe the fear that many Zimbabweans have when it comes to expressing their opinions on the government. If you went into a street in Zimbabwe and asked 100 people to publicly comment on the government for an online article, using their real names, you would struggle to find just two people to do so. This is different to America and many countries in the world where citizens are at least able to say that they disagree with the government. Before you make conclusions who supports and who criticises the Zimbabwe government, please consider the whole picture. You know what? You can also visit Zimbabwe without TBEX. It’s worth the money, believe me. I Love your well informed articles. I love traveling and sharing my country with people who come to experience it. I feel they get reliable and unbiased information on your site to prepare for their trip . Keep up the good work !! Hi Beth, I LOVE your fair, balanced, informed examination of the controversy surrounding both Zimbabwe and TBEX’s decision to hold a conference there. As a Responsible Travel enthusiast with a deep personal love of southern Africa, I really want this conference to provide positive benefits for local people, local travel businesses, and visiting bloggers alike. To that end, I have agreed to provide my consulting services to TBEX pro bono. My goal is to ensure there is education on the importance of Responsible Travel at TBEX, and to ensure that those local companies you mention have an opportunity to be involved in the conference. Can you recommend any good resources for connecting with those companies? Feel free to message me privately at info@GreenGlobalTravel.com to discuss! As an American who will be traveling through Zimbabwe this summer, I found this post very enlightening. I have actually been wondering whether my tourist dollars spent in Zimbabwe will stay with the hard-working tourism professionals or get sidetracked to more corrupt government organizations and individuals. More and more I see travel as a political action against prejudice and corruption. Thanks for this information. I owe you a coffee. Thank you for sharing your thoughts Beth. As someone speaking with direct experience about Zimbabwe and as a journalist I greatly appreciate your point of view. My hope is that TBEX does what you mentioned-team up with progressive organizations that care about locals and the local economy. I know there is already a partnership with a global responsible travel company. It is important to see what unfolds over this next year. 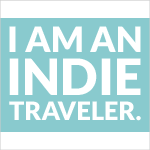 I believe that having a genuine experience is what any travel writer would want. I am not in support of the government and the atrocities committed so I hope there is a divide between that and the conference. If anything TBEX participants can make the world more aware of what is taking place in Zimbabwe. Interesting since as I read parts of your article it reminded me of the situation in Cuba and how locals are treated without freedom of speech, fear of the government and people disappearing. I visited last year and wrote about these experiences and hope for a change for Cubans. I also thought of the PDA and dress code you mentioned. While in Dubai my husband and I did not display PDA out of fear of being arrested. People warned us of this prior to going but I still wanted to visit and learn about the country knowing I had to abide by their laws and customs. It’s also been written about in my post and others above the fear black people have while living in America. Black Lives Matter is a result of that. I will keep myself informed of TBEX and Zimbabwe leading up to this conference and I hope others will as well. Hi Nadeen, thank you for responding. My aim is to add another voice to the debate, and to hopefully provide more context about the situation in Zimbabwe. I’m looking forward to seeing how the conference unfolds, as it could be positive, if done right, as you say.